Your 2010 Democratic candidates need your help, and all you do is sign your name! We have candidates running for 34 offices who need signatures of several hundred registered voters to have their name placed on the 2010 Democratic Primary ballot. The Petition-Signing event will be Thursday, November 5th, any time between 5:30 and 8:30 p.m. at the VFW Post 8541. Please come support your Democratic candidates, and meet your current and future elected officials. Bring your family and friends. If you tell us that you and your guests are coming, we will pre-print your petition information and save you time. You can skip the label-printing line and go directly to the candidates and their petitions. RSVP by calling the office 785-0962 or emailing bcdp@bexardemocrats.org, and provide your name, address, and birth date or voter ID. Petition-Signing Partyfor 2010 Democratic Primary Candidates, Thursday, November 5th. Come any time from 5:30 to 8:30p.m.VFW Post 854, 12222 Austin Hwy. Thank you for working for democracy! Join John Sharp,(photo) Rep. Roland Gutierrez and Sen. Leticia Van de Putte for ‘Scare in the Square’ fun October 31st — and bring the kids!”Saturday, October 31st from 3-6 p.m., Milam Park at Market Square. Live music by Gabe Nieto and the Jalapeno Express. Moonwalk bouncing, face painting, trick-or-treat candy, and a scre-e-a-a-ming good time!LULAC will host a voter registration tent for adults. Sign up to make your voice heard in the upcoming special U.S. Senate election! 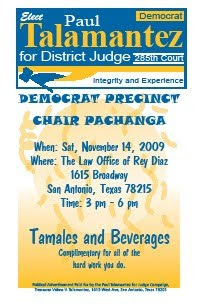 Come meet State Sen. Van de Putte, Rep. Roland Gutierrez and U.S. Senator-to-be John Sharp at a VIP reception in La Margarita restaurant to kick off the fun at 3 p.m.
Democrat Precinct Chair Pachanga, Saturday, November 14th from 3-6 p.m. @ the law Offices of Rey Diaz, 1615 Broadway. 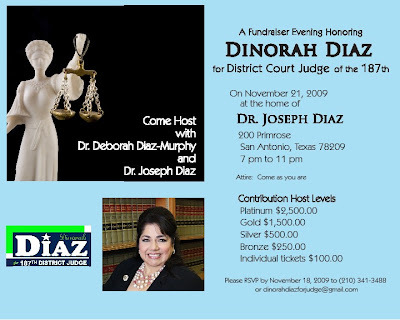 Fundraiser for judicial candidate for the 187th District Court, Dinorah Diaz, November 21st @ the home of Dr. Joseph Diaz, 200 Primrose, from 7-11 p.m.
November 5th-Thursday, November 5th-County Court at Law No. 4 Judge Sarah Garrahan Fundraiser Reception. 5:30 - 7 p.m. at Cadillac Bar. For information and reservations, contact at 210-335-2426. November 5th-Petition-Signing Party for 2010 Democratic Primary Candidates,th. Thursday, November. Come any time from 5:30 to 8:30 p.m. VFW Post 854, 12222 Austin Hwy. Thank you for working for democracy! 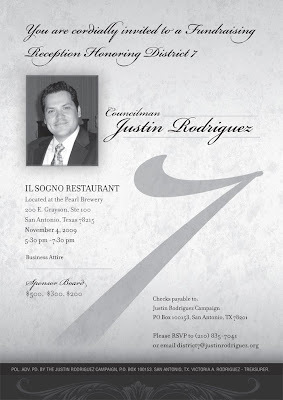 November 5th-Mission Democrats of Bexar County, Thursday, @ 7 p.m. @Presa Community center, 3721 S. Presa. November 5th-Build Your Business Network, Thursday, November 5th from 7-9 a.m. @ Aldaco's Mexican Cuisine, 100 E. Hoefgen @ Sunset Station. November 5th-Working Women's Celebration. You are invited to a party for Paul Talamantez, candidate for Judge of the 285th District Court, November 5th from 5:30-7:30 p.m. @ Absolutely Everything Catering, 3915 San Pedro Ave. 78212. Please RSVP by October 30th to 385-9075. November 5th- The National Society of Hispanic MBAs (NSHMBA) - San Antonio Chapter is hosting its 11th Annual Gala to help raise funds for scholarships for graduate students. The keynote address will be delivered by Texas Secretary of State Esperanza "Hope" Andrade and she will be introduced by San Antonio Deputy City Manager A.J. Rodriguez,Thursday, Nov. 5th @ 6 p.m. Reception & 7 p.m. Program, @ Witte Museum, Prassel Auditorium, 3801 Broadway. November 6th-Friday, Republican Party of Texas Headquarters Grand Opening Launch Party, Ribbon Cutting at Noon in Austin. November 6th-Commencement Speaker Rep. Mike Villarreal. the Galen College of Nursing will hold its first graduation ceremony for registered nurse (RN) graduates, as 35 RN students receive their Associate of Applied Science degrees in Nursing. am permitted to offer associate degree nursing education in the state of Texas. Galen College of Nursing Graduation Ceremony, St. Paul Community Center, 1201 Donaldson, 7 p.m.
November 7th-2009 Human Rights Campaign (HRC) Gala & Silent Auction, Westin Riverwalk Hotel, @ 7 p.m. Theme "Speak the Truth." November 7th-Judicial candidate (County Court #4) Alfredo Ximenez will host a Backyard BBQ, Saturday, November 7th from noon-3 p.m. @ the Frio Bar & Grill, 801 N. Frio. Tickets are $10. November 7th-Fundraising Reception & Silent Auction, for the Bexar County Young Democrats with guest speaker Mayor Julian Castro November 7th @ 13707 Cape Bluff, 78216. All funds raised will be used for the 2010 Bexar County Democratic Primary “Get Out The Vote” activities targeted to voters 18 - 35 years of age. November 9th-Monday, former Councilwoman Delicia Herrera's official announcement to run for Commissioner Pct. 2, 10 a.m. Bexar County Courthouse steps. Plan to arrive 15 minutes before. 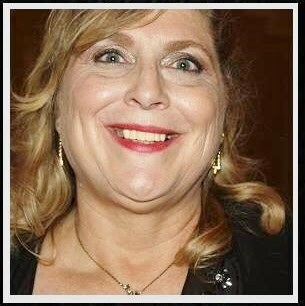 November 10th-Launch party for a rising star for judicial candidate for the 437th District Court, Pamela Gabriel Craig, Tuesday Nov 10th from 5:30 to 8 p.m. at the home of Steve and Carrie Sinkin with other sponsors to be named at a later date. November 10th-Fundraiser for Commissioner Sergio "Chico" Rodriguez @ the Little Red Barn from 11:30 a.m.-1 p.m. More details to follow. Nov. 12th-Judge Michael LaHood Fundraiser @ 5:30 p.m. @ Absolutely Everything Catering, 3915 San Pedro Ave.
November 12th-Stephanie Boyd Fundraiser for Judicial Candidate, 290th District Court, Thursday, November 12th, 6- 8 p.m. @ Tommy Moore’s Café & Deli, 915 S. Hackberry. November 12th-Thursday, -Hon. Richard Price for 224th District Judge Campaign Kickoff Fundraiser Reception, 5:30 - 7 p.m. at TBA. November 13th-You are invited to join Congressman Charlie Gonzalez, for an unforgettable fundraising evening @ Casino Casablanca @ the Pearl Stable, from 5:30 p.m.-9:30 p.m.
November 14th-Paul Talamantez for Judge, Democrat Precinct Chair Pachanga, Saturday, November 14th from 3-6 p.m. @ the law Offices of Rey Diaz, 1615 Broadway. November 16th-Please join special guests from the Spurs Bruce Bowen, Malik Rose & NBA Superstar Tim Duncan, & ABC's "Desperate Housewives" Actor Ricardo Chavira, for a reception honoring District Attorney candidate Nico LaHood @ the El Tropicano Hotel, 110 Lexington from 6-8:30 p.m. Monday, November 16th. RSVP: Sherry Boyles @ 296-8577. Tickets: $100 each. Sponsorships available. November 19th-Burning Desire, "Ceramic Sculpture by Laurel Gibson" Exhibit, Friday, @ 5:30 p.m.- Saturday, December 19th @ 5 p.m.
@ the Bihl Haus Arts, 2803 Fredericksburg Road, 78201. November 20th-Lori Valenzuela, newly appointed Judge of the 437th Judicial District Court, kickoff fundraiser at the Valencia Hotel on November 20th from 5:30 p.m.-7:30 p.m.
November 21st-November 21st-Save the Date-Fundraiser for judicial candidate Dinorah Diaz for the 187th District Court, @ the home of Dr. Joseph Diaz, 900 Primrose, from 7-11 p.m.
November 21st-Judge Peter Sakai presents Family Fest featuring SA Super Star competition showcasing the strength of SA Youth, Saturday, November 21st from 11 a.m.- 8 p.m.For more info call: Alice Guerra @ 732-8111. November 26th-Raul Jimenez Thanksgiving @ Henry B. Gonzalez Convention Center @ 10 a.m.
December 3rd-Thursday, December 3rd, Save the Date for Judge Ernest Acevedo campaign party. More info to come. December 3rd-Thursday, - 4th Court of Appeals Justice Marialyn Barnard Fundraising Reception, 5:30 - 7 p.m. at TBA. For information contact Janelle McArthur at 210-699-1925. December 8th-550 KTSA Talk Show Host Jack Riccardi hosts his annual "Wrappin with Jack" @ Northside Ford on 281 from 7-9 p.m. Bring an unwrapped Christmas toy to Northside Ford for wrapping by Jack's wrappers. December 10th-Majella, San Antonio Benefit Dinner, Thursday, December 10th @ 7 p.m., Grand Hyatt San Antonio, 600 E. Market St. Guest Speaker Actress Kathy Ireland. Community transformation starts with fervent prayer! Join with Protestants and Catholics from across San Antonio and cry out to God! No reservations required. Just show up ready to intercede for our city! The National alliance of Craftsmen presents an evening with Linda Ronstadt in concert, Saturday, November 7th @ Municipal Auditorum. 223-4418. Lori Valenzuela, (photo) newly appointed Judge of the 437th Judicial District Court, kickoff fundraiser at the Valencia Hotel on November 20th from 5:30 p.m.-7:30 p.m.
Military veteran & San Antonio native Larry Romo (photo) was nominated by President Barack Obama to head the Selective Service System. Romo, a retired Air Force Reserve Lieutenant Colonel is an admissions liaison officer for the Air Force Academy where he earned his undergraduate degree. If confirmed, Romo will oversee the draft if it is re-instated. The Honorable Municipal Judge Lawrence Morales of Leon Valley (27 yrs.) , Live Oak (7 years), Boerne (5 yrs), and China Grove (3 yrs), announced his candidacy for Judge of the Bexar County 285th District Court in front of a crowd of family, friends, and neighbors at the old Black Diamond Grocery Store on the corner of 24th and Poplar St., on Saturday October 24th. "This is where it all began, where I learned the values of hard work and community, selling watermelons with my Dad, these lessons and values I gained while young, I will always remember as I decide the important cases that effect everyday people that will come before me as Judge of the 285th. I am keenly aware of the importance of electing, and keeping competent, experienced, and impartial judges in the Bexar County Courthouse." "The Honorable Michael P. Peden has presided over the 285th District Court for many years with honor and dedication. Judge Peden is not seeking re-election, and has decided to retire from the bench at the end of this term. It would be my honor and privilege to succeed Judge Peden, and to continue serving the citizens of Bexar County", announced Judge Morales. Surrounded by Morales supporters and local residents at the Black Diamond Grocery Store at the intersection of Poplar & 24th Streets on the city's westside, the crowd was treated to fresh watermelon slices and an intimate musical performance by award winning and Smithsonian honorees, Max Baca and David Farias of Los TexManiacs. Judge Morales is a graduate of Fox Tech High School. He earned his BA in political science from St. Mary's University and a Doctor of Jurisprudence from Thurgood Marshall School of Law. Judge Morales is also proud of being an award winning coach of Rosedale Select Baseball League. The Rev. 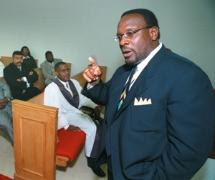 E. Thurman Walker, (photo) the pastor of Antioch Missionary Baptist Church who tripled the membership of his congregation, united local African American churches, built interfaith bridges and expanded his church's reach through partnerships with business and political leaders, died Mondayafter a decadelong battle against cancer.He was 50. “Rev. Walker was a tremendous leader of the San Antonio religious community,” said Rabbi Barry Block, senior rabbi at Temple Beth-El, who worked with Walker on many interfaith activities. “He was a towering figure, not just on the East Side, but for all of San Antonio.” In his role at Antioch, Walker balanced his duties with his own congregation with that of building a coalition of African American churches and interfaith efforts. A San Antonio native, Walker began his ministry here in 1987 as the assistant pastor to the Rev. John Joseph Rector Sr., who had served 40 years in that position. Walker became pastor after Rector died in 1993. Under Walker's leadership, Antioch grew to around 3,000 members and tripled its budget. In 1995, he founded the Christian Academy, a private school at the church. In 2000, Walker founded a nonprofit corporation, the Antioch Community Transformation Network, to provide an alternative way to serve the community in addition to traditional church-based programs. Meanwhile, he led the creation of Community Churches for Social Action, a coalition of East Side churches that gave them a larger voice as a group. 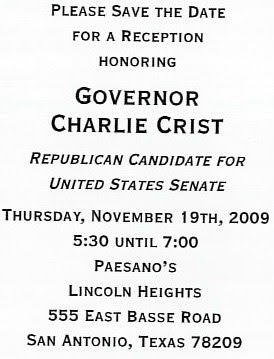 He also worked behind the scenes in business and politics, and last year he delivered the opening prayer at a campaign appearance by then-Sen. Barack Obama. Walker came to the ministry well-prepared in business and religious matters. He received his bachelor's in accounting from Colorado College, his master of divinity degree from the Interdenominational Theological Center at Morehouse College in Atlanta, and his doctorate in ministry from United Theological Seminary in Dayton, Ohio. Walter L. Starks, pastor emeritus of Grace First Baptist Church, called Walker a people-person and dynamic leader. “He will be so missed,” Starks said. “He made a tremendous impact and leaves a tremendous loss in the East Side community.” Walker's cancer was diagnosed in 2000. In declining health, he turned over the church's daily operations several months ago. Staff Writer Vincent T. Davis contributed to this report. We are very pleased to announce that Cathie Adams was elected Chairman of the Republican Party of Texas this past weekend. In a vote of 36-25 by the State Republican Executive Committee (SREC) Saturday, Adams was elected to succeed Tina Benkiser, who stepped down as chairman Oct 5th. The vote took place at a special called meeting of the SREC, at the party's headquarters in Austin. Cathie Adams comes to the party from a long career supporting the conservative cause in Texas, as an election judge, a member of the district, state and national resolutions/platform committees; a Delegate to every senatorial and state convention since 1988; and a Delegate to the 1992, 1996, 2000, 2004 and 2008 Republican National Conventions. Fundraiser for Judicial Candidate, 290th District Court, Thursday, November 12th, 6- 8 p.m. @ Tommy Moore’s Café & Deli, 915 S. Hackberry. 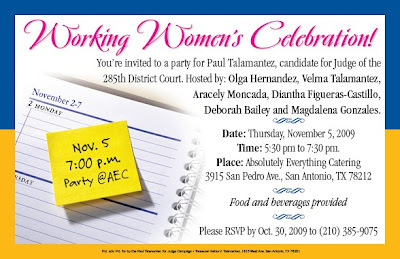 You are invited to a party for Paul Talamantez, candidate for Judge of the 285th District Court, November 5th from 5:30-7:30 p.m. @ Absolutely Everything Catering, 3915 San Pedro Ave. 78212. Please RSVP by October 30th to 385-9075. Councilman Philip Cortez drew a number of elected officials and business leaders to his fundraiser @ the Giraud club, 10-27th.